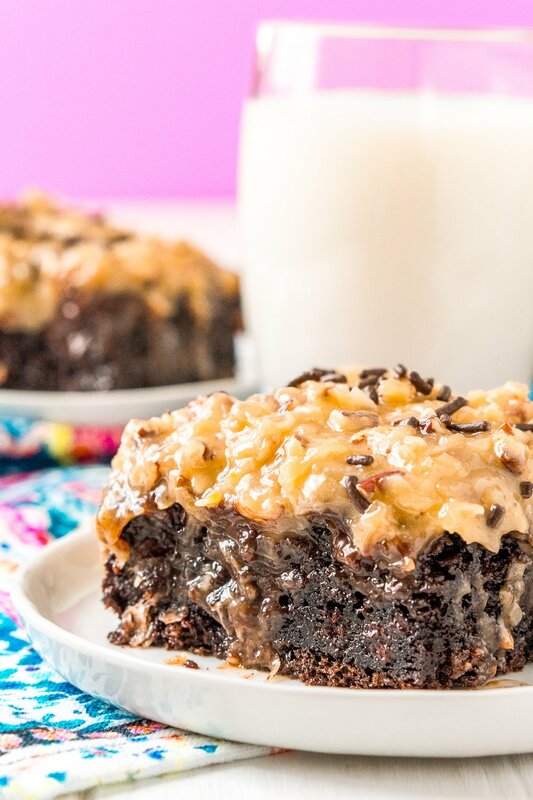 This German Chocolate Poke Cake takes the classic dessert recipe to a whole new level with a tender chocolate cake soaked in sweetened condensed milk and topped with a rich chocolate ganache and sweet coconut pecan frosting! 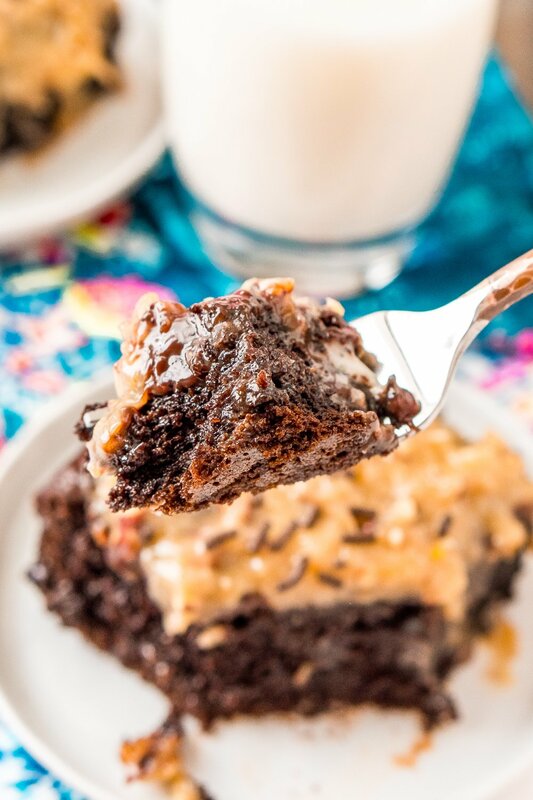 Guys, this German Chocolate Poke Cake might be one of the sweetest things to ever come out of my kitchen! When it comes to dessert, this cake means some serious business! 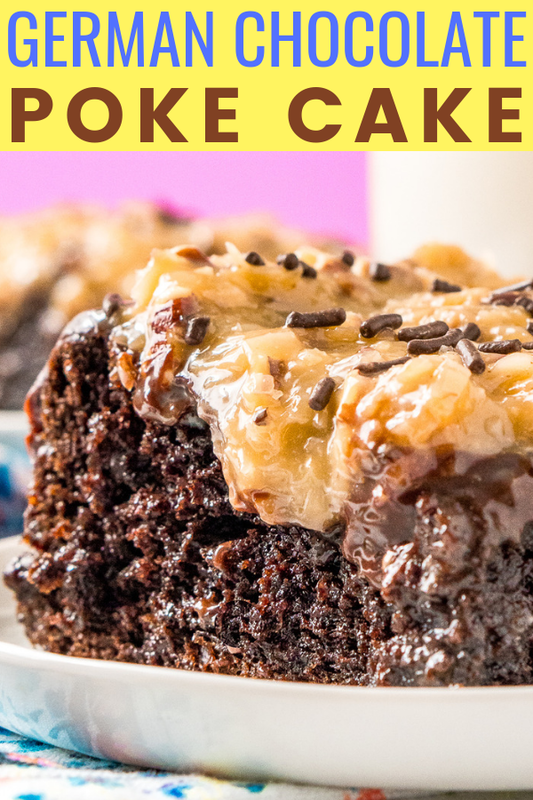 If you’re a German Chocolate Cake fan, chances are you’re going to love this modern take on the classic! A tender chocolate cake is baked in a 9×13-inch pan then soaked in sweetened condensed milk and topped with a silky smooth chocolate ganache made with German Chocolate. It’s finished off with a super delicious Coconut Pecan Frosting which is the key to a delicious German Chocolate Cake! 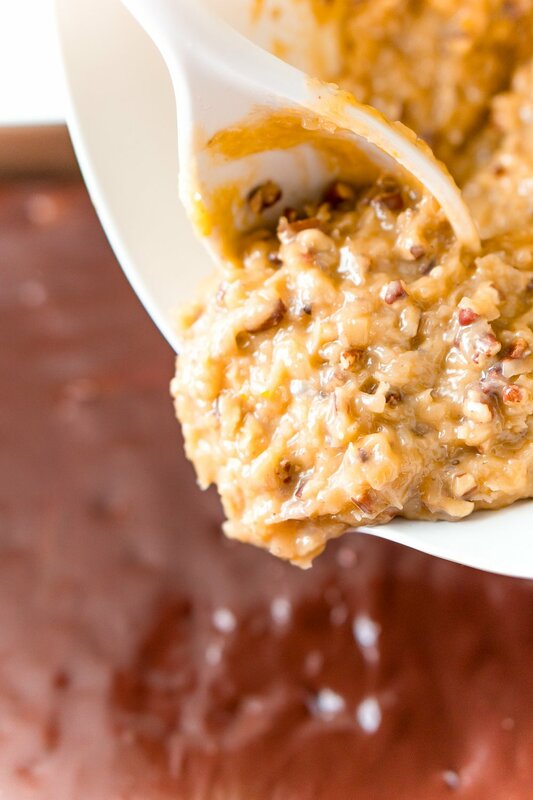 Where Did German Chocolate Cake Come From? Contrary to its name, the original cake recipe originated in the United States, not Germany. In the 1850s, a man named Samuel German developed a specific type of dark chocolate for Baker’s Chocolate Company. The company then named the chocolate Baker’s German’s Sweet Chocolate in honor of him. But it wasn’t until over 100 years later that this chocolate became famous. 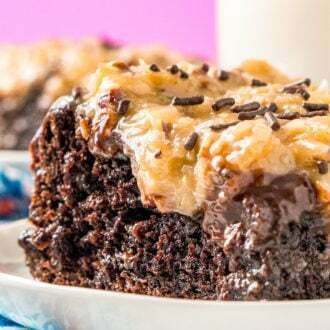 A Texas homemaker made the first German’s Chocolate cake with it in 1957 and sent the recipe to the local newspaper who published it. And somewhere along the trail or recipe reprints, the name lost the apostrophe and became German Chocolate Cake. 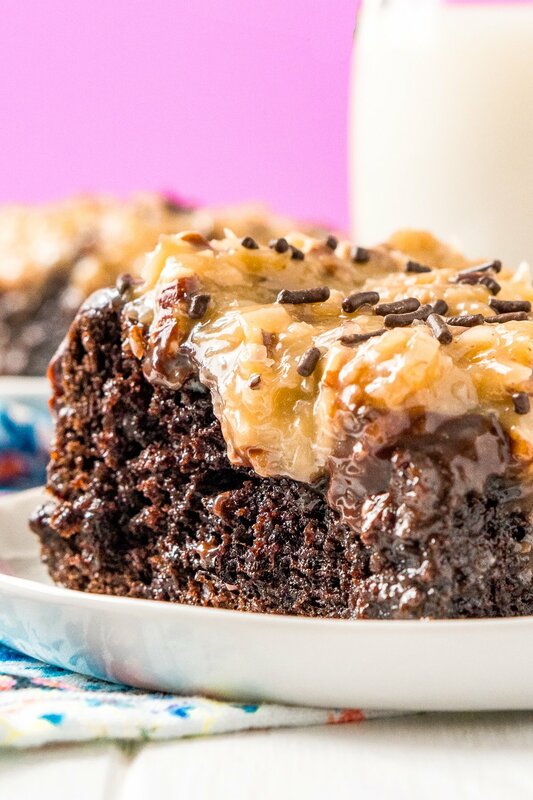 Does German Chocolate Cake Have Coconut? The cake itself doesn’t have any coconut in it, but the iconic Coconut Pecan Frosting that tops it does. This cake has a lot going on, but you don’t need to be a skilled baker to make it. You don’t need any fancy piping or anything like that, just a bit of time and unfortunately, a whole lot of dishes! 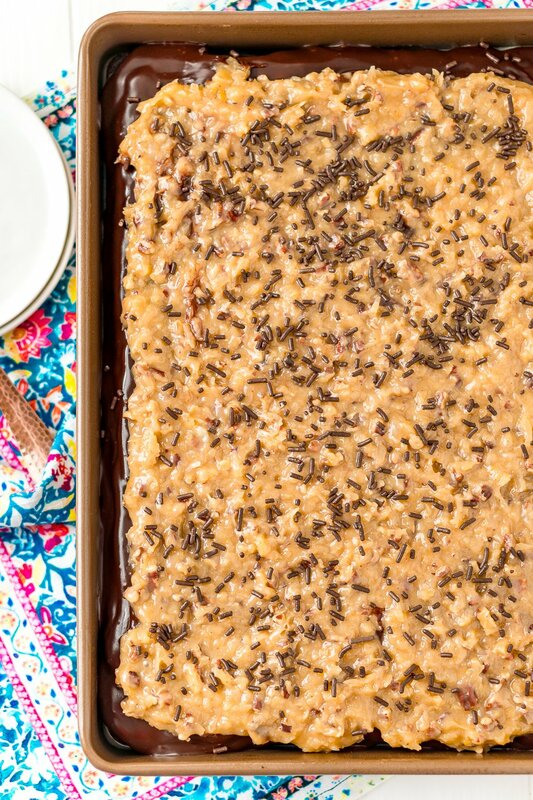 You’ll begin by mixing up your cake batter and baking it in a 9×13-inch pan. 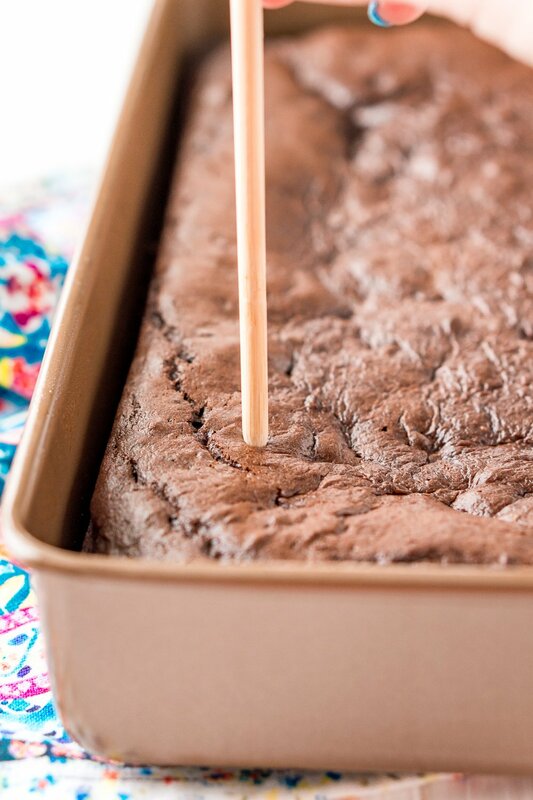 Once baked, you’ll use a wooden skewer to poke holes all over the cake. Pour a can of sweetened condensed over the cake and spread it out with a spoon making sure to cover the whole thing. It’s best to do this step while the cake is still warm so the milk absorbs better. Next, you’ll prepare your ganache with the Geran’s Sweet Chocolate and heavy cream. Once the ganache has thickened up, but it still spreadable, pour it over the top of the milk-soaked cake. Finally, prepare and top the cake with the Coconut Pecan Frosting, spreading it evenly over the top of the cake but it doesn’t need to go all the way to the edge. Does German Chocolate Cake Need To Be Refrigerated? No, but it can be. 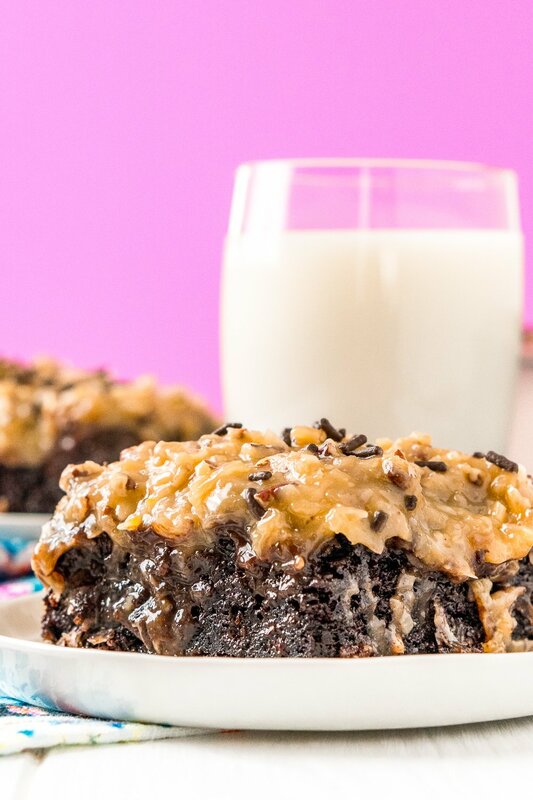 A German Chocolate Cake will last for about 4 days at room temperature but up to 1 week in the fridge. I recommend pulling it out of the fridge about an hour before serving. Can German Chocolate Cake Be Frozen? It absolutely can, however, it can be hard to do given the size of the pan, so I recommend wrapping it really well in freezer-safe aluminum foil and plastic wrap. These 2-gallon freezer bags could be a good storage solution too! Traditionally, German Chocolate Cake is topped with a Chocolate Frosting, but I opted for chocolate ganache instead because I thought it was a bit easier and a little more fitting for this poke cake recipe. I wanted something that would soak into the holes and add extra decadence. And trust me, this cake is definitely decadent! This cake is destined to be a crowd favorite and it’s sheet cake nature makes it easy to transport for potlucks and family get-togethers! Click the button above to save this delicious recipe to your board! I created a fun little group on facebook and I’d love for you to join in! It’s a place where you can ask questions and see what’s new with Sugar & Soul! If you’d like to check it out, you can request to join HERE. Preheat oven to 350 degrees F and spray a 9x13-inch baking pan with cooking spray and set aside. In a large bowl or stand mixer, combined all of the cake ingredients until fully mixed and pour into the prepared pan. Bake for 30 to 40 minutes or until toothpick comes clean from center of the cake. Remove from oven and poke holes in the cake with the handle of a wooden spoon or a skewer. 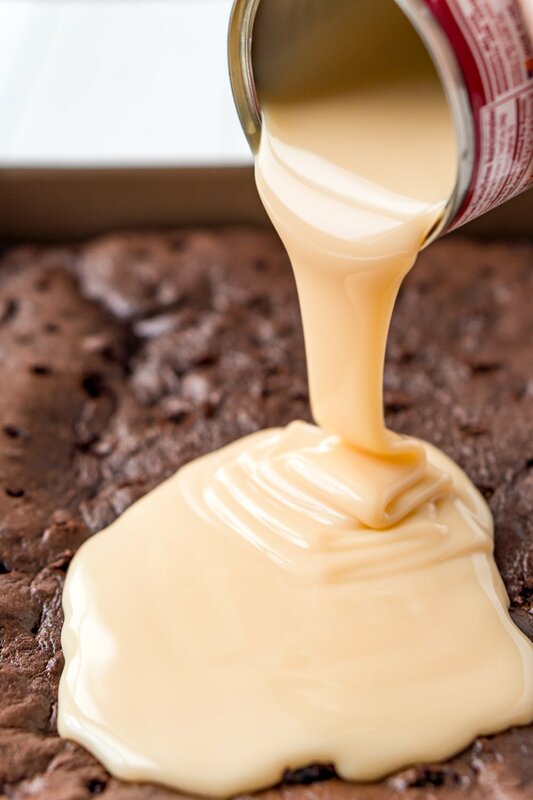 Pour the sweetened condensed milk over the top of the cake and allow it to soak in while the cake cools. Once the cake has cooled, prepare the ganache by placing the chopped chocolate in a medium bowl and then heating the heavy cream in a small saucepan just until the edges begin to boil. Pour the heavy cream over the chocolate and allow to set for 4 minutes, do not stir. 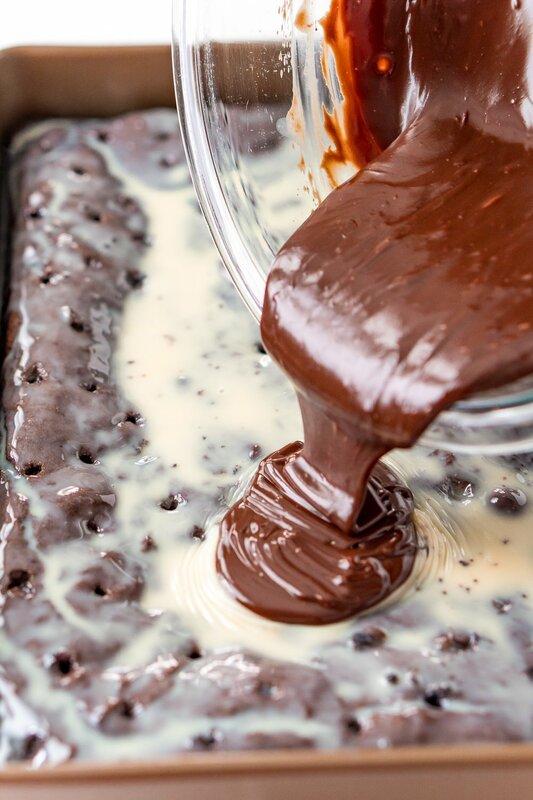 After 4 minutes have passed, whisk together the chocolate and heavy cream until rich chocolate ganache forms, allow the ganache to sit and thicken for 5 to 10 minutes before spreading evenly over the top of the cake. Next, prepare your Coconut Pecan Frosting according to the recipe instructions here and then spread it over the top of the ganache covered cake. Enjoy immediately or store in the fridge. If German's Baking Chocolate cannot be found, semi-sweet chocolate may be used instead. You had me at cake! !